The legendary silver box which is hallmark in electronic music has been recreated in the AudioRealism Bass Line Synthesizer. Sophisticated analog modeling techniques have been employed to create a DSP-algorithm that accurately emulates every aspect of the original Bass Line, from growling basses to hollow middles and beeping highs with metal rattling accents. 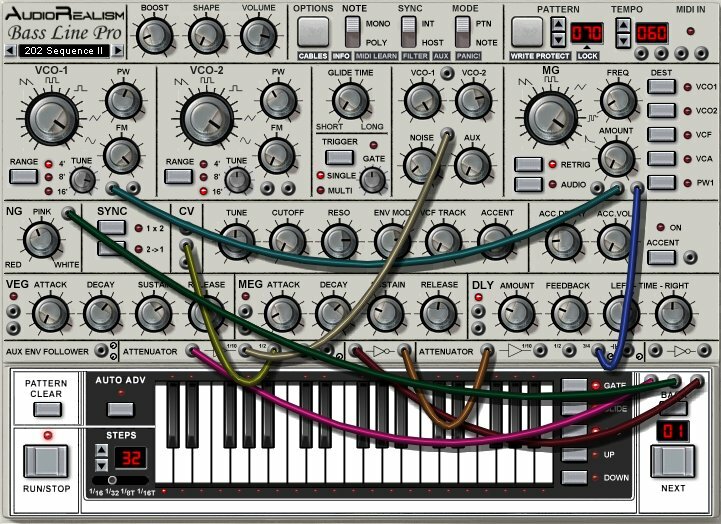 Patterns are composed in a fashion similar to the original Bass Line using the integrated step sequencer with easy to use manipulation functions such as transpose and randomization. Effective range - All controls such at cutoff and resonance have an effective range that is unmatched by most other software synthesizers. The characteristic 18dB/Octave low-pass filter can resonate from 20Hz to 22kHz covering the whole spectrum of sounds that the original Bass Line produces. Full controllability - Patterns are selected via Midi and played in perfect sync with the host sequencer. In addition an alternative Midi mode allows you to play the synthesizer like a normal device via keyboard or external sequencer. User assignable Midi CC’s ensures full controllability. The startup script allows the user to configure how the plug-in should be initialized at start-up, so you can set your favorite mode and it will be retained. Improved 18dB/oct filter emulation and overall sound improvements. MIDI keyboard programming (i.e. you can assign MIDI keys to buttons on ABL2's interface and program remotely).